A travel plug wasn’t a necessity years ago, but now that we all have phones and tablets it is vital to be able charge these devices when on holiday or travelling for business. The HiCollections Universal Adaptor Travel Adapter Plug is the perfect tool for the job! Gone are the days where you have a simple adaptor for the region you are visiting, available now are products like the HiCollections Universal Adaptor Travel Adapter Plug. It can be used worldwide in over 150 countries, can charge 3 devices or more at the same time. It has dual USB ports and free universal cable included that has 1 x USB Mini, 2 x USB Micro, 1 x Apple Lightning and 1 x Old Apple Connector with a male USB to plug into travel adaptor. So that really takes care of most of your devices and if yours isn’t included, you can just plug your devices USB lead into the plug via plug socket or one of the two USB slots! The different plug socket configurations are easily selected via two sliders, one slider release the European style two pin and another releases the UK plug one way and USA/Canada with another and then in the USA/Canadian mode, you can turn the pins for use in Australia and New Zealand. 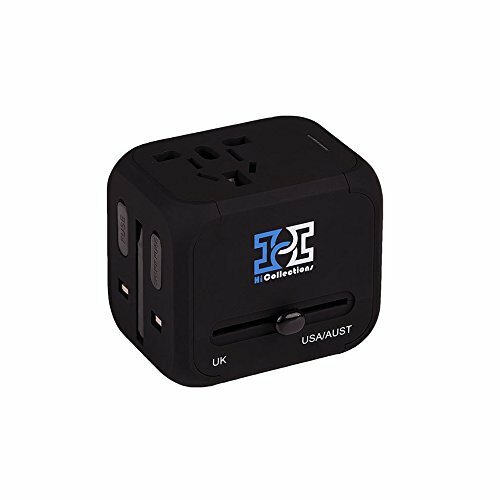 I am really impressed with this travel adaptor that comes in its own case, but even if you are not travelling, this little adaptor would also be a great buy for the home, by plugging in you can still plug-in a plug and then you have two powered USB slots. The HiCollections Universal Adaptor Travel Adapter Plug costs £17.99 from Amazon and you can purchase it via the Buy Now button at the top of the review, it is available with free delivery with Amazon Prime and if you don’t have Prime, you can sign up for a free 30 day trial here.